The scene is an online video meeting. (Does that qualify as a scene?) In it are several Venezuelan writers and photographers gathered in a classroom in Caracas (all men but one, though not everyone is present) and their counterparts in and around Sarajevo, Bosnia and Herzegovina, gathered mostly in twos and threes at laptops in apartments (all women but two; everyone is present). A couple of Caracas photographers also tune in from what appear to be their flats. One Bosnian is in the town of Bihać. A Croatian writer from the Sarajevo group joins from Spain. The Venezuelans in the classroom are having technical difficulties with their audio, and people move close to the room’s single computer to be heard. We make introductions. A few jokes. We lay out our plans. At least one Sarajevan, a redhead perched on a sofa, enjoys a cigarette. I tell her, well, there were only three such Americans in the meeting. She notes the other writers on her couch were also enjoying cigarettes, only off camera. “So at least it wasn’t secondhand smoke,” she says. We laugh. I’ve known the Sarajevans since 2012, when I launched the Sarajevo Writers’ Workshop, a bilingual group of poets and prose writers—the women at the laptops. At the time of that first meeting, I was based in Atlanta, Georgia, and serving as the exchange’s writing workshop facilitator. Our photography workshop facilitator, Elizabeth D. Herman, participated from Bosnia and Herzegovina (on assignment, it happened). IWP’s distance learning coordinator, Susannah Shive, could be seen in front of a bookcase near Iowa City, Iowa. Dijala’s three U.S. Americans. We’d started in difficult circumstances. In May, the Balkans (particularly Bosnia and Herzegovina and Serbia) had been hit by apocalyptic flooding, and the political situation in both countries was grim. Earlier, in February, Sarajevo and Caracas had experienced violent protests. In Venezuela, many people had died. We’d called the exchange “Narrative Witness” as a way to encourage participating writers and photographers to tell the stories most important to them and in whatever way they felt most compelled. Ricardo wrote his diary in Spanish—participants wrote in either Spanish or Bosnian/Croatian/Serbian, with the exception of some in the Sarajevo group who wrote in English. With the help of translators whose efforts were, quite simply, heroic. On the literary side (the photographers worked differently), groups of three and four writers would submit stories of up to 1500 words on a weekly basis. Mirza Purić—also an Asymptote editor-at-large—in Sarajevo and Mariela Matos Smith in Caracas (Daniel Narváez in Toronto translated one of the Caracas pieces) would then rapidly turn around rough English translations. We posted both the original pieces and their English versions, and critiquing would commence in written English, as our workshops were asynchronous. At any given time, about half of the participants could comment on a piece having also read it in the original language. This multilingual approach produced resonant discussion. We wrote quite a bit about the cultural references in Ricardo’s diary (i.e., whether or not he should consider reducing their number for a global audience) and about slang in Hensli Rahn Solórzano’s darkly comic story “La Guaira 1989” (i.e., was the slang effective in translation, and how might slang be approached in translation generally?). Almost immediately, we saw common themes emerge. Violence and street life, for instance, appear in the Caracas literature. In “The Trees of Sarajevo/Los árboles de Sarajevo,” Fedosy Santaella tries to connect his city’s breakdown with what happened to Sarajevo during the nineties war, taking the reader on a walk through the streets of Caracas, where he witnesses a robbery by motorcyclists—“flies,” he calls them. Sonia Chocrón submitted “Molar/Muela,” a story about a mother who, in the midst of a water shortage, searches for a cistern truck driver so she can beg him to bring water to her home. She finds herself and her daughter faced with a group of kids doing drugs in an alley. One boy becomes her go-between with the truck driver. She gets the water, but it soon runs out. She returns to the alley—“like an addict about to collapse”—and meets the boy again. When she goes back a third time he is no longer there. The story ends without reprieve: “It was hot. Very hot.” Hacía calor. Mucho calor. After reading Sonia’s piece, I wrote to our translator Mariela Matos Smith asking whether the water situation in Caracas was still severe. The situation as a whole, she said, was worse. 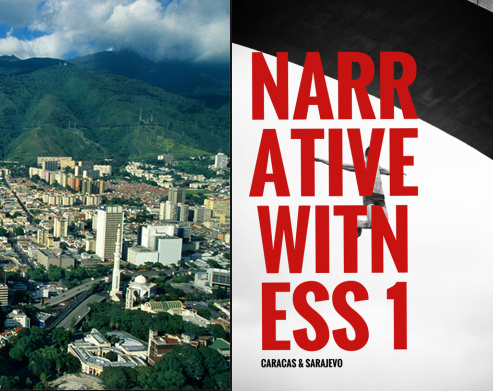 I began to see thematic similarities between the Caracas pieces and those produced by the Sarajevo writers. In the same group with Sonia’s “Molar/Muela” was an essay by Marina Alagić-Bowder, a British woman who’d moved to Bosnia and Herzegovina during the nineties war and married a Sarajevan. Marina’s essay, “The Cow in the Bathroom,” links memories from the city during wartime with present-day realities; in her piece, as in Sonia’s, characters are short of water, filling toilet tanks by hand. While pieces by Marina and Naida (“Count to Ten/Broji do 10”) address the war, others of the Sarajevo stories deal with domestic abuse. Dijala Hasanbegović’s dark, lyrical piece, “A Lexicon of Great Historical Moments/Leksikon velikih povijesnih trenutaka,” ends with the female protagonist and her cousin—abused by her own father—burning the family house, indeed the whole village, to the ground. Daniela Valenta’s mirthful “The Ice Cream Orchard” is edged with the reality of spousal abuse, and directly deals with bullying, in a Sarajevo mahala. Nermana Česko’s “Chair on My Eye/Stolica na oku” revolves around emotional abuse in a marriage; the story is narrated by the floor in the couple’s home. All through the work one finds the complexity of loss. Zerina Zahirović’s dense, poetic prose piece, “The World Is Made of Empty Wombs and Apple Seeds/Svijet je sačinjen od praznih utroba i jabučnih sjemenki,” follows a woman as she gives birth. “I am a mother now, and I was but a worm. Never shall the empty wombs of the world recover.” Neđla Ćemanović’s “A Red Crayon” is written from the perspective of a woman who has recently had a miscarriage and comes face to face with a child whom she sees as grotesque. Humberto Valdivieso wrote a series of short prose pieces, “Three Ways to Fall When Balance Is Lost/Tres formas de caer cuando se pierde el equilibrio,” to accompany a triptych of his own photographs, exploring the loss of romantic love. In fact, while in a wide range of styles, most of the work from our project seems to tackle dark themes—though not without humor. Hensli Rahn Solórzano’s “La Guaira 1989,” the tale of an insurance heist pulled off by two brothers, points to the absurd nature of living and money-making in a particular culture, while exposing the loneliness. Kulović Selma’s “Child of Stone” is a witty dialogue between two sisters, challenging societal expectations and the issue of fate—nafaka. Matea Šimić’s “The 10th Circle” is comic, honest, and brooding—narrated by a young woman on public transportation in a Balkan city, projecting her sense of failure as a daughter onto a disappointed man. Mirza Purić (translator, Sarajevo): I like to read the text carefully, identify the problems, try to come up with potential solutions for each problem, and so on. I read everything I can get my hands on about the author, the work, and, most importantly, about everything that’s mentioned in the work. In both languages if possible. In addition to the obvious benefits, this boosts my confidence and makes me feel good about the mistakes I am about to make. I like my mistakes honest. Oftentimes, if I do my homework properly, producing the actual translation is almost a matter of how fast I can type. None of this was even a remote possibility during the NW project. I had a few days for each piece, which wasn’t terrible, but as I was also working on other things throughout the project, most of the stuff I did had to be knocked off overnight. However, this was not the biggest challenge. The source texts were mostly unedited (or very lightly edited) first drafts, and this had to be apparent in the target texts. The whole point of the project was for the authors to give each other feedback, edit each other’s work in a way; therefore, it was critical that the Spanish and English speakers were able to see the weak points in the original texts . . . I had to err where the authors had erred before me, on top of my own brain glitches. Recreating grammatical, stylistic, and other mistakes required reverse engineering, breaking things down to their lowest-level constituents, which in turn required time—something we didn’t have. In the end, I was almost sorry that all those carefully translated slips of the pen were going to be edited and buffed out. Mariela Matos Smith (translator, Caracas): [The project] has given me the opportunity to share with different cultures, perspectives, and world views. That contact gave me a rich vision of humanity. Something that is interesting and important for me at the same time. . . . I had the opportunity to exchange with beautiful and marvelous people. They were always attentive, open, and nearby to us. I learned many ways to deal with reality, feelings, suggestions, very interesting points of view. Dijala Hasanbegović (Sarajevo): I think that during the workshop you develop this genuine feeling that you can understand, critique, and read text written in English translation or in English as a second language because it’s not the language alone that is important for understanding the art of writing fiction or poetry. It’s its intention to become something more than a language as a communication tool, to become literature. And you can see it and feel it in any language. Fedosy Santaella (Caracas): [Working in English] was a little bit difficult, but at the same time it was a challenge for me to use my limited knowledge of English language to talk about literature and most of all, about writing—your writing and other people’s writing. Talking about the other people’s work in a different language was like doing poetry . . . You don’t say things directly in poetry . . . I had to use the number of words I know and my limited knowledge of English syntax to say more complex things. . . . [I]t was like twisting the language, like doing poetry. Sonia Chocrón (Caracas):** Although English is not my native language, it became easy to keep up with the texts and the group’s comments. First of all, because the translations were speedy, accurate, and timely. Second, because English is a language with which I feel comfortable and to which I turn with frequency . . . All the contributions of my group mates . . . made my little story called “Molar” grow in its density, information, and feeling. They even gave me the opportunity to gaze through different eyes from a sidewalk other than my own, which enlarged my point of view. José Tomás Angola Heredia (Caracas):** To engage in intellectual work in another idiom is a demanding challenge, because it requires not only the sharing of ideas and views but also the capacity to express them in a suitable way. Languages are cultural expressions, much more than simple mechanisms of communication. Management of verb tenses, for example, is different in each idiom because it embodies a way to conceptualize reality and circumstance. The same happens with the use of adjectives, contractions, or syntax. They are examples of how we think in each society. The most significant and rewarding fact was to understand emotional perception, which differs from person to person according to their experience. The culture from which we come, which has its visible application in the language we speak, is a filter that modulates what people read to such an extent as to convert into hilarious for some that which can be tragic for others. Adjusting myself to that was the most challenging and engaging task. Forcing myself to reach the most unexplored places about which many have tried to write was a demanding exercise but interesting at the same time. Joaquín Ortega (Caracas):** My experience was completely rewarding in intellectual and human terms. Reading the literary work of people from different cultures broadened my vision. We feel we are face-to-face with our urban realities. The city is one, despite the distances, and all of us are characters walking on foot. Reading my work in English let me feel complete, because English is much more direct than Spanish. And for me it contains its own sonority that resembles an audiovisual narrative. Kulović Selma (Sarajevo): Through the NW project, I was honored to have had an opportunity to get feedback from people with different cultural and personal backgrounds and who might not share my perspective on even the minute, mundane things. Their comments were hugely important to me because I wish to discuss universal themes in my work to which people from culturally and linguistically diverse backgrounds can relate. We had another couple of meetings by video. Not everyone could make it. One weekend, Internet was particularly spotty in Caracas. Some of the Sarajevo writers were present. Dijala enjoyed a cigarette. Ricardo tried to get into the meeting from Plaza Venezuela—no luck. We had Isabella for a few moments. It was Independence Day, and she said she thought the military would have some exercises. Then she was gone. Jokes were a requisite part of this project. The end was friendship—along with our collection of work, which includes pieces not mentioned here, as well as photo essays by Oscar B. Castillo, Alejandro Cegarra, Vanja Čerimagić, Efrén Hernández Arias, and Vladimir Marcano. I will never go there. Nunca iré allá. But why not? I want to ask, ignoring the realities. Why can’t we—all together—go? **Translated from the Spanish by Mariela Matos Smith, revised by Mishy Lesser. Cover photo by Vanja Čerimagić. Cover design by Skylar Alexander. Stacy Mattingly is a U.S. writer and the founder of the Sarajevo Writers’ Workshop, a bilingual group of poets and prose writers in Bosnia and Herzegovina. She has led the workshop since 2012. Stacy holds an MFA in fiction from Boston University, where she was a Marcia Trimble Fellow, a Leslie Epstein Global Fellow, and recipient of the Florence Engel Randall Graduate Fiction Award. She has worked as a collaborative writer on books including, with Ashley Smith, the New York Times bestseller UNLIKELY ANGEL, which recounts an Atlanta hostage story, to be released in September 2015 as a feature film, CAPTIVE. Stacy has taught creative writing at Boston University and helped lead the first Narrative Witness exchange for the University of Iowa’s International Writing Program. She has just completed a first novel, set in the Balkans.